A colonial house converted into a luxurious 5 star hotel. 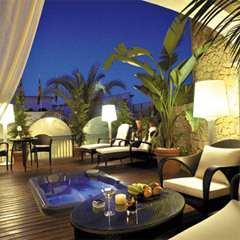 The hotel is located in the heart of Ibiza’s old town, declared Human Heritage by UNESCO in 1999. It offers spectacular views to the Mediterranean Sea and Ibiza’s harbour. Only 10 minutes to the nearest beach, 8 km away from the airport and only a few minutes by foot to the best shops and restaurants in town. The hotel offers a free transfer service from the airport / harbour; an exclusive restaurant offering a wide selection of the finest wines. There is also a small pool on the outdoor terrace. Room service is served 24 hours a day. Es Mirador - offers a complete Mediterranean cuisine prepared by the avant-garde young Ibizan chef Juan José Ribas. La Enoteca - offers a wide and select sample of the best wines from both the island and the rest of the country. Cockail Bar - offers a great selecton of the best cocktails. Outdoor Pool, the grand suite offers a sauna, a small gym and a outdoor jacuzzi. A 25 m2 business centre Is located on the first floor with capacity for 5 people. With WiFi-equipped computer, printer, telephone and with possibility of serving coffee break during the meetings. The hotel is located in Ibiza old town, within the symbolic walled Dalt Vila area (UNESCO World Heritage since 1999), just five minutes walk away from the town centre and about 2km from the nearest beach.